A drafting board is a flat, tilted work surface used for drawing, sketching, and writing on large sheets of paper. It also comes in handy for viewing oversized documents and making craft projects. Generally, a drafting board features one or more fasteners to keep paper in place. Other features may include a T-square of parallel straight edge to draw horizontal or vertical lines. Along with other instruments like a protractor and set square, these tools glide over the surface to prevent accidental movement while working. Why Do You Need a Drafting Board? 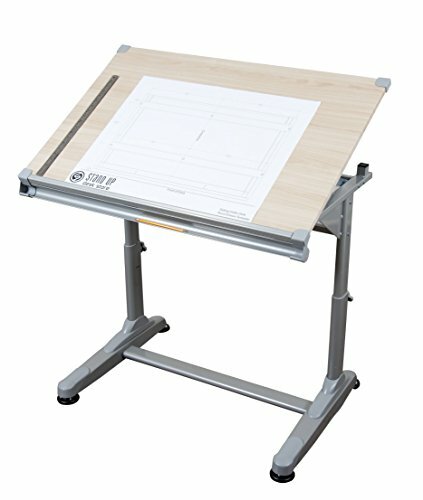 A drafting board provides a smooth, stable surface to create drawings. In fact, when you use a drafting board, you minimize paper shifts, wrinkles, depressions, and rips. Plus, some drawing boards combine many of the tools required to produce accurate illustrations, such as a parallel ruler and markers. Most importantly, though, you can adjust the angle of a drawing board to meet your comfort level. When you draw at an angle, you get a better depiction of the proportions of various elements in the design. Who Needs a Drafting Board? Drafting boards provide easy maneuverability for use in a variety of applications. Architects, engineers, and others who need to produce detailed designs find that a drafting board helps increase precision and reduce drafting time. Moreover, the tilted board is easy on the eyes, arms, hands, back, and neck, providing welcome relief when you work on drawings for long periods. A drafting board provides a large work area, allowing you to represent an idea. The smooth, flat surface allows you to produce high-quality illustrations. There is less chance of the paper moving or slipping, so you achieve flawless pencil movements. You handle the paper less often, leaving it in pristine condition. Ergonomic design allows you to customize the drafting board to a position that works best for you, so you can use the entire arm and shoulder as opposed to just the wrists. The incline position also helps you avoid neck and back problems associated with working for long periods. The tilted surface gives you a better grip of your pencil and drafting tools, so you can make natural and fine lines. Portable or Tabletop Boards: Usually, these boards are less than 42 inches and may include drafting instruments. Most units include handles for easy transport to a classroom or job site, making them suitable for both students and professionals. You will find models with tilters and folding legs that remove or collapse for easy storage in a closet or under a bed. 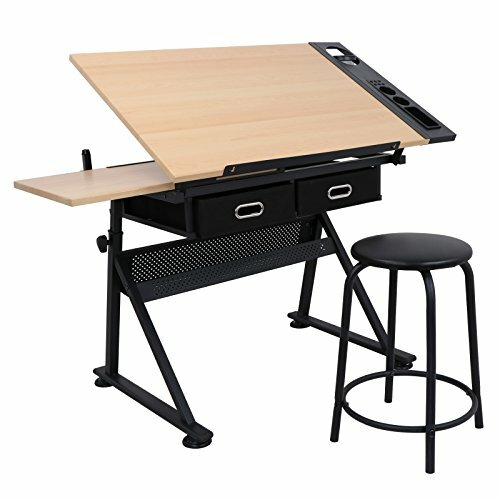 Drafting/Desk Combo: A drafting/desk combo lays flat and can tilt up to 30, 45, or 60 degrees. They are best suited for working on detailed blueprints or construction drawings illustrations. Some models include side trays and drawers to store and organize drafting supplies. Few options include a glass top, which when used with a light provides a backlit surface to view architectural drawings, film, and transparencies. Multipurpose Drafting Board or Table: This type of unit tends to be a permanent fixture and requires more space. Generally, a multipurpose board will have configurations to adjust the height as well as the angle. Besides drafting, you can use these units to work on hobbies and crafts. 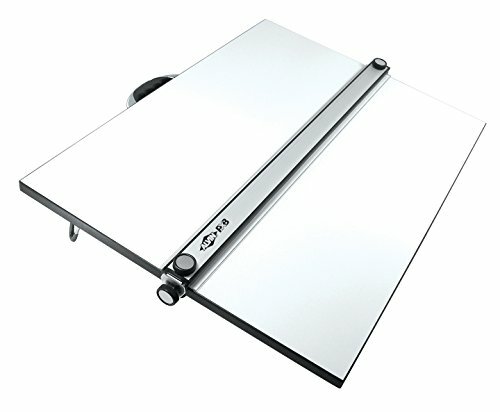 Product Features: Made of premium acrylic, this portable A3 drafting board features a Stop-and-Go mechanism and magnetic clamps for easy and secure positioning. Equipped with a guide rail for smooth, straight-edge movement, this portable drafting board comes with a pair of board tilters for easy height adjustments. 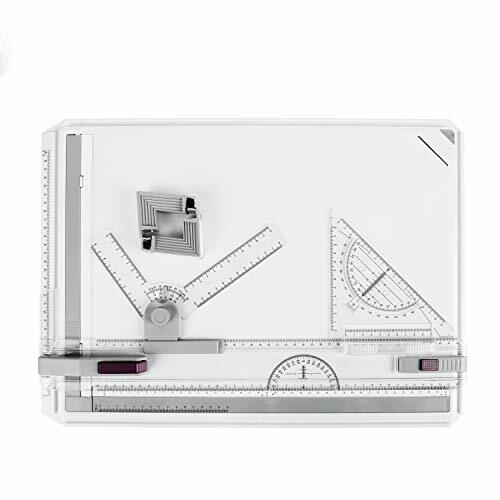 Besides horizontal and vertical rule markings, it features a removable 180-degree protractor, set square and graduated compass to help you produce accurate drawings. Feet allow you to elevate the surface for a more comfortable work position. Verdict: The A3 drafting board is ideal for individuals who need a drafting board to take out in the field or have limited space for a full-size table. Features: This multipurpose drafting board doubles as a standing or sit down desk. You can angle it for drawing or lay it flat to work on other projects. With oversized thumbscrews, you enjoy a full range of height and angle adjustments. A lip at the bottom of the board prevents the paper from falling off when it is in the tilt position. The pedestal base and rubber feet provide a stable foundation for a large work area that measures 39”W x 26”D. Verdict: The stand-up/sit-down desk is a good option for beginners and students. At a little over 3’ feet wide, it fits well in a corner of a dorm room, bedroom, or home office. Features: With tempered blue safety glass and a polished steel frame, the Artie’s Studio Office Drafting Table is as stylish as it is functional. The top tilts upward to 30 degrees to accommodate your drawings. Side trays and slots offer easy access to your drafting utensils. Additionally, three drawers provide ample room to store other essentials. The configuration allows drawer placement on the left or right side of the drafting table. Verdict: This drafting table is ideal for architects, engineers, and graphic artists. It provides a large work area with plenty of room to keep supplies organized. 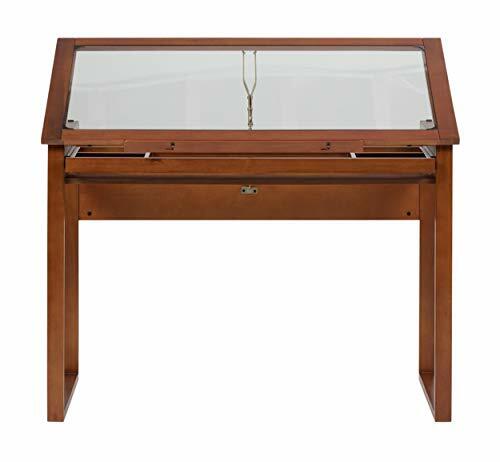 Features: This glass top table lifts to 30 degrees and features a sturdy wood frame. The thick border around the glass is wide enough to clip-on a light to view blueprints, designs, and other materials. It also has a lip on the bottom of the frame to prop up T-squares or place pencils. A sliding drawer with five partitioned compartments allows you to store pencils and organize drafting supplies. Verdict: The rich, Sonoma Brown frame looks great in a small design studio or home office. With a generous work surface and a five-partition drawer, you can work with ease and have all your drafting tools within reach. You can also fit a small filing cabinet or printer stand on the side without interrupting the workflow. Features: This durable glass and steel table offers years of use. A simple mechanism tilts the workspace up to 60 degrees. The light softens as it hits the reinforced glass top, making it ideal for creating drawings and tracing. A bottom pencil ledge holds papers and props up books when tilted. Interchangeable trays on each side allow you to arrange drawing tools to complement your workflow. 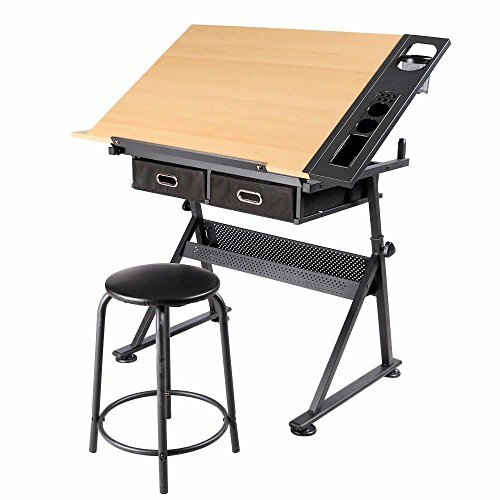 The drawing table also comes equipped with cloth drawers and 360-degree swivel casters. Verdict: The Yaheetech Drafting Table is the perfect solution for individuals who need a mobile unit that won’t take up too much space. Its overall dimensions are only 40.94 x 23.62 x 31.5 inches. 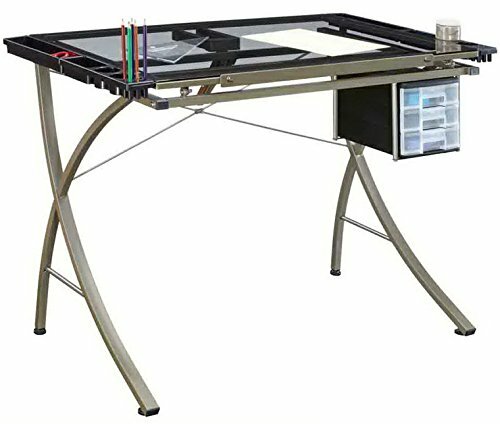 Features: The ZENY draft table comes equipped with a 34″ x 23.62″ work surface that tilts from a flat desk position to a 45-degree drafting board. A right side tray and left tool table offer room to lay out instruments and hold drafting supplies. For added comfort, this unit comes with a padded stool. Verdict: This workstation is perfect for drawing and working on crafts. It’s a great choice for those who have to share a workspace with others. Besides the tilting capability, this unit adjusts from 28” to 35.8” in height, making it comfortable for short and tall people. Plus, it features two 12” x 18” drawers for office and drafting supplies. 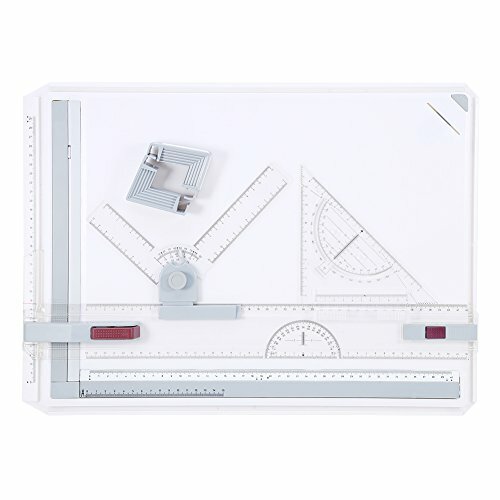 Features: This professional-quality drafting board has a built-in parallel straightedge to improve the accuracy of technical illustrations. Soft, rubber edges improve your grip, increase comfort, and provide better control. The 34” x 24” smooth Melamine workspace offers bump-free drawing. Inking edges under the straightedge tool help minimize smudges. Folding metal legs sit at an angle to prevent the board from collapsing while in use. Rubber tracks allow you to hang the board off the edge of a table to achieve your desired drawing angle. Verdict: The Alvin PXB36 is a suitable choice for architecture students who require a smooth drawing surface, but lack the room for a larger model. Comfort grip handles make it easy to carry it to the kitchen and place it on a table, or to the classroom to sit on a desk. Features: This A3 drafting board is almost identical to Frylr’s A3 model. It features two parallel rulers with a stop-and-go mechanism, a set square with a marked protractor, and two corner clips. Sturdy tilters allow you to adjust the board to a low or high position. Verdict: The YoSoo A3 comes ready to use. It offers a smooth and stable work surface for drafting. The ergonomic design allows you to work comfortably on a job site or classroom.